Good morning! Welcome to The Morning Shift, your roundup of the auto news you crave, all in one place every weekday morning. Here are the important stories you can go on and on about while you’re busy distracting yourself from your day job. You’ve heard about it a lot: President Donald Trump isn’t a big fan of the North American Free Trade Agreement, and wants to significantly rework how U.S. trade goes down. 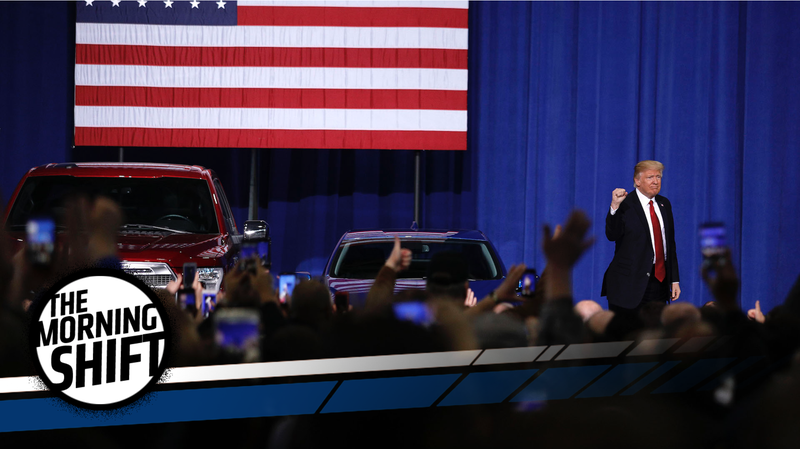 There’s been concern about how Trump’s unfavorable ideas toward non-U.S. production could hike the price of small cars due to production costs in Mexico versus the U.S., and he’s managed to change manufacturers’ existing production plans. Bloomberg reports that the thing about car production is that on paper, it makes for a big trade deficit to Mexico. The U.S. had a trade deficit of $63 billion to Mexico in 2016, according to Bloomberg, in comparison to a $7.7-billion surplus with Canada. Bloomberg reports that the trade deficit for cars with Mexico at $74 billion, which means getting rid of that trade would put America at a surplus. There’s already evidence automakers and their suppliers may not even need NAFTA. Under the agreement’s rules of origin, cars must have North American content worth 62.5 percent of the vehicle’s value. Automakers could also shift out of North America as a whole, like Ford did recently by moving Focus production from Mexico to China. It’ll be up to manufacturers to wait and see how things play out, but if you’re a worrier and like to stay on the safe side, maybe it’s still best to buy a new small car sooner than later. Takata, the company responsible for the biggest automotive safety recall ever, filed for bankruptcy this week. As outlined in its proposed restructuring plan, a smaller company called Key Safety Systems took Takata over. Takata also offered some passive condolences to victims and those killed by its air bag inflators, which didn’t really include an apology. Most of Takata’s obligations are owed to automakers for recalling and replacing millions of its air bags, and the Japanese supplier’s restructuring plan relies heavily on financial support from its customers. Several personal injury lawyers told U.S. Bankruptcy Judge Brendan Shannon that Takata had made too many concessions to automakers, without investigating the value of their claims. Lawyers for TK Holdings and General Motors Co (GM.N) argued the need for financing outweighed the need to investigate the protections granted to the automakers, which could be investigated later. The company has set aside around $125 million for individual claims in relation to its air bags, according to Reuters. The sale of Takata to Key Safety systems was worth about $1.6 billion. Germany plans to create a national diesel forum to cut emissions, according to a short and sweet report from Reuters. The new plan comes alongside Germany cracking down on diesels in general. Ministers said Tuesday they will also create a new testing organization to renew customer confidence after Volkswagen’s huge Dieselgate emissions scandal in September of 2015. The consequences from that are still going, by the way. The move comes as sales of diesel cars have been falling. Many German cities, including Stuttgart and Munich, have considered banning some diesel vehicles, blaming emissions for causing increased respiratory disease. The plan also comes right after the German transport ministry began pushing manufacturers to update engine software to help cut emissions in more than 12 million diesels, according to Reuters. This diesel drama never stops, does it? PSA, the parent company of brands like Peugeot and Citroen, wants to have “hands-off” autonomous technology in its cars after 2020, Automotive News reports. But that’s not as futuristic and cool as it seems: The company wants “Level 3” autonomous cars by then, which basically means humans have to take back control anytime the car asks them to. Level 2, or “hands off,” will be offered after 2018, first on the DS 7 Crossback, then shortly afterward on other DS cars, as well as Peugeot and Citroen models. Level 2 automation will include automated parking and Connected Pilot, which monitors the car’s position within its lane and relative to other vehicles. Level 3 “hands off” features will appear in 2020 on the assumption that regulations are changed to allow that to happen. PSA would first allow what it calls “chauffeur” autonomy in traffic-jam situations, followed by highway autonomy in which the car drives in autonomous mode whatever the traffic conditions. That will be followed after 2025 by Level 4 (“mind off”) and Level 5 (“driverless”) autonomy. Drive.ai, a company working on self-driving cars that learn like a human brain, announced on Medium Tuesday that it raised $50 million in additional investor funding for its work. It also hired Carmen Chang and Andrew Ng, with Chang on the business side and Ng—who’s been head of the “Google Brain” project for deep learning and worked at self-driving tech company Baidu—in tech. This isn’t some random startup they’re joining, either. The Drive.ai autonomous technology can drive smoothly in rainy conditions without human intervention, as we learned earlier this year—clearing a major hurdle for the technology. The company was founded on $50,000 in April of 2015, and raised $12 million in a first round of funding in January 2016. It got a California testing license for its self-driving cars later that year, and now, it’s got a whole lot more money to work with. The company’s post said its current plan is to focus on enterprise stuff first—delivering packages and stuff—and then spread the technology to different parts of the world and expand its cars’ global coverage as time goes on. The reasons for the merger were to be found in the economic situation after World War I. The German motor industry saw itself faced with a structural crisis having to convert production to civilian goods. As a result, new motor manufacturers established themselves in the market – their number rising to over 120 in those years. Traditional companies like Benz & Cie. and DMG were suddenly faced with fierce competition. Their prices increasingly came under pressure. For the time being, the two companies only had technically outdated pre-war vehicles to offer. Moreover, they operated huge plants with large workforces whose capacities were far from being fully utilized. As if this had not been enough, sales were in a desolate state after the war, especially because German manufacturers were no longer allowed to export their products under the stipulations of the Treaty of Versailles. You can read the whole story here, if you feel like it. Neutral: What’s Your Trust In Diesels Been Like Over The Last Few Years? Diesels are the holy grail, yes. They’re even better if they’re manual wagons, and brown. But as far as new diesels are concerned, how has your trust in them been affected since Dieselgate first broke? We all figured out that the scandal was much bigger than Volkswagen, which makes you constantly wonder which automaker will be next. So, how has your mentality toward newer diesels been affected over the last couple of years?